Coming in October, Inductive Automation will release a new module specifically to empower Ignition software to better interface with instruments. This module will add seamless interfacing capabilities for instruments to collect data and make that information available to your entire Ignition HMI, SCADA or MES system. 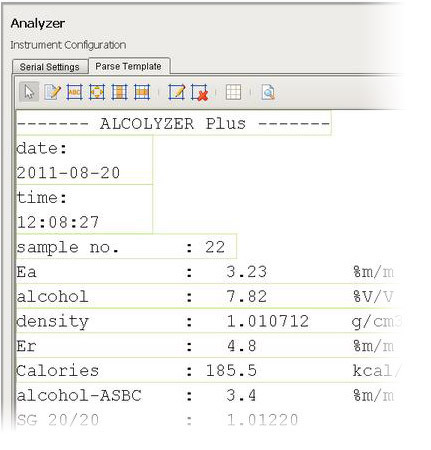 The new module receives raw textual data from instrument type devices via serial, text files, OPC devices and more, then parses out the meaningful values that can be used in Ignition, saved to databases or passed along to other systems. Historically this has been a difficult task to do because supervisory control and data acquisition (SCADA) and human machine interface (HMI) systems do not support communications to the type of devices that fall into this category. IMAGE A: Shown above is a sample parse template containing textual data with parsing boxes defining the values to be extracted and converted to numeric values. Each parsing box will find the label configured for it, extract and convert the value associated with the label. Because of these limitations, past remedies have been complicated and not easily maintainable. Such a solution might involve connecting a device to a basic module with 300 lines of code just to get the meaningful values into the programmable logic controller (PLC), then finally reading the values into the SCADA system. Other solutions could involve custom computer programs written in a language like Visual Basic or C# and then passing the values to the SCADA system. Both of these solutions have multiple layers and are difficult to troubleshoot when the data stops flowing. Using the Ignition Instrument Interface Module, you can implement a cleaner solution by directly connecting the device to the SCADA system and using the interactive parsing designer to eliminate hundreds of lines of code and extract the meaningful values. Some of the key features coming in this module are serial communications, file monitoring, parsing and centralized instrument management. Ignition clients can accept values from serial devices. This is very common when reading from O2 analyzers, measurement gauges, barcode readers and many other instruments found in the lab or on the plant floor. The Instrument Interface Module is perfect for devices, such as the GagePort NT, where values are sent when the operator presses the send button or a request is sent to the GagePort NT to read the values. 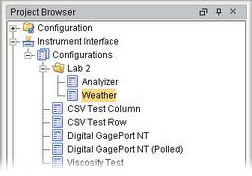 The serial support built into the Instrument Interface Module includes polling the device for new data, receiving unsolicited data from the device, or based on an event in Ignition requesting the new data from the device. It gracefully handles timeouts and other communication issues that are common with serial communications but also includes the flexibility, if needed, of controlling every byte sent or received using script. Some instruments only support passing data through the use of a file; this module makes the process easy. You can also read values from external software programs that only support passing data through the use of files. The format of the data can vary from a reports format, CSV (comma separated values) or even a mixture of the two. 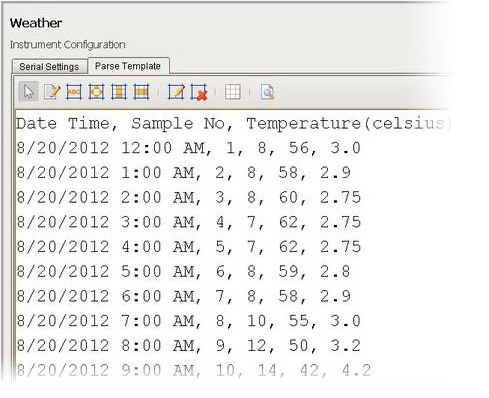 IMAGE B: Shown above is a sample columnar-based CSV parse template. It will extract date, time, sample number, temperature and humidity values and make them available to be accessed in Ignition. IMAGE C: The project browser in the Ignition Designer manages all instrument configurations in one central location, facilitating easy set up and maintenance. At the core of the Instrument Interface Module is a powerful parsing engine. Beyond processing raw data from serial or text files, any textual data that can be read into either the Ignition client or server can be parsed into meaningful values. This opens up the door to collect data from a variety of sources through the most straightforward manner. An example is reading temperature and humidity from a device that exposes readings on a simple HTML web page. By using script in Ignition the HTML content can be read and then the temperature and humidity values can be extracted and converted to numeric values using the parsing engine. Shown above in Image A is a sample parse template containing textual data with parsing boxes defining the values to be extracted and converted to numeric values. Each parsing box will find the label configured for it, extract and convert the value associated with the label. Other types of parsing boxes allow extracting values at fixed locations, processing CSV columnar data and processing CSV row-based data. A parse template can contain a mixture of any number of the different types of parsing boxes. The textual data shown in the parse template can be read directly from the serial device, read from a file, pasted from the clipboard, or typed in manually. From there, parsing boxes can be drop onto the textual data and the details of how to extract and convert the values are configured. Because companies have many instruments of the same types, a central location to configure them will reduce the effort to reuse and maintain them. Over time you will see configurations for many common devices included with the Instrument Interface Module. A configuration can be copied or modified to reduce the time required to set up communications with your unique device. The new Ignition Instrument Interface Module will be available for purchase in October.